When working together with Page Personnel a specialised Recruitment Consultant will be assigned to you and will take full ownership of your recruitment needs. They manage all the steps in the recruitment process, something we call A to Z responsibility. 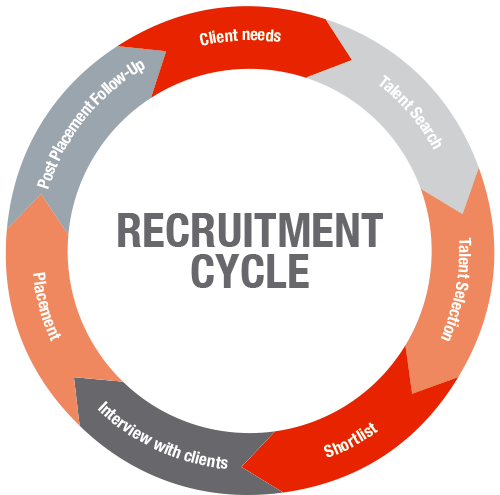 Below you will find a simplified outline of the recruitment cycle. We are aware that no company is the same, that every person unique and that all opportunities differ from each other. Therefore, we also offer a tailor-made solutions that meet your specific needs, wishes and demands. When you got in touch with your local Page Personnel office, or after you have uploaded a job brief to our website, we will schedule a personal meeting where we will refine the required candidate profile. After the refinement of the required profile, we start with the sourcing of potential candidates through our networks (industry-leading database, talent pools, direct search), advertising and social media. Identification of suitable candidates: interviews, assessments and reference checks. Presentation of appropriate candidates, based on profile, experience, skills, availability and qualifications. Your opportunity to interview candidates to assess the best fit with requirements and corporate culture. Following a successful interview, your Recruitment Consultant will assist and lead the negotiations between you and your chosen candidate. This includes supporting you in offering the candidate a suitably attractive remuneration package and planning for their smooth integration into your organisation. As part of a recruitment consultancy that operates worldwide with hands-on market knowledge, we’re well placed to offer informed solutions for all your hiring needs. Looking to recruit? Contact your local Page Personnel office now.